Or, in a remote desktop environment, configuring the connection. There is no software to install, you're just creating a shortcut. Each Windows user that needs access to the software should have a shortcut or Remote Desktop Connection. 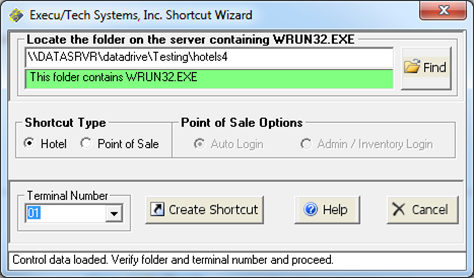 All users who run Execu/Suite will need to have full control of the Execu/Suite folder on the server. No other access to folders on the server is needed except in special, very rare circumstances. This is the basic layout of the typical client-server setup on a TCP/IP network. When finished, your shortcut properties will look similar to this. THIS IS ONLY AN EXAMPLE! Your shortcut will differ based on options described, below. Our software uses command line arguments to specify the menu structure and terminal number. Your primary concern is the terminal number, explained below. When making a shortcut, you must enter both the "Target" and "Start in". 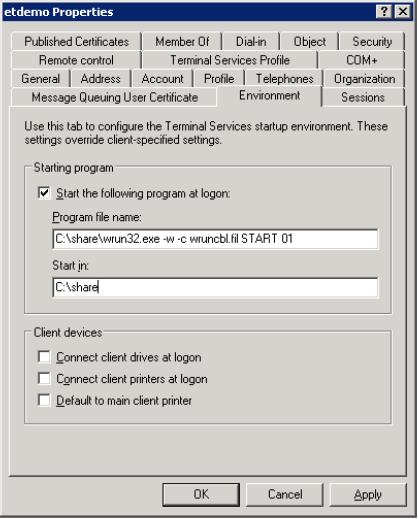 An example "Start in" is: "\\server\share\"
There is an additional command line argument that can be added to an Execu/Suite Point of Sale shortcut that will auto login directly to the keyboard screen. The terminal number is a two digit number from 01 to 96 placed at the end of the shortcut. With either method, each client must have a different terminal number specified in the shortcut. Terminal numbers 97, 98 and 99 are typically reserved for Execu/Tech support operations. Execu/Tech does not maintain a list of each customer's terminal numbers. The customer numbers them and should make a note of what terminals are used and where. Sometimes you need your terminal to access a City Ledger, General Ledger or Inventory batch that another terminal also accesses. We allow 8 separate batches at a time, based on the terminal number. Using this table, you can see that the first batch can be accessed by terminals 01, 09, 17, 25, etc. So, if you need access to the same batch that terminal 07 is using, you will need to use a terminal number in the same column. The first option, creating a shortcut on the client. DO NOT USE A MAPPED DRIVE! Use the UNC! To assist with this first method, we provide a program called the Shortcut Wizard. This program will create a shortcut using a correct command line and will automatically register all ActiveX controls. If you’d rather not manually create the shortcut, use this program to create a desktop shortcut for you. Select the appropriate options then click, "Create Shortcut." Did you see a "Run-time error"? If you did then you either failed to perform step 1 or you do not have administrator permissions. Follow step 1 then call your IT to determine if you have administrator permissions. Unable to save shortcut "C:\Users\Public\Desktop\HOTEL User 05.lnk". This window will be unresponsive as long as the bottom status bar is blinking red and white with the message, “Loading user control data. This may take a couple minutes so be patient.” It’s compiling a list of all ActiveX controls and DLLs that need to be registered. When it’s done you’ll see the status bar remain white with the message, “Control data loaded. Verify folder and terminal number and proceed." At this point, you’ll also notice that the ‘Create Shortcut’ button has appeared. A window will appear with several options. Since the program was run from the Execu/Suite folder, you don’t have to locate the folder, that field will already be filled with the correct folder. To create a shortcut for Execu/Suite, you simply need to select your desired terminal number then click the ‘Create Shortcut’ button. You won’t be notified if your selected terminal number is already in use, so be sure you’re selecting the correct terminal number to avoid any confusion or security warnings when running Execu/Suite. The second option, Terminal Services and Remote Desktop. This is the responsibility of your IT professional. When using Remote Desktop, you have the option of using RemoteApp - Running as RemoteApp. 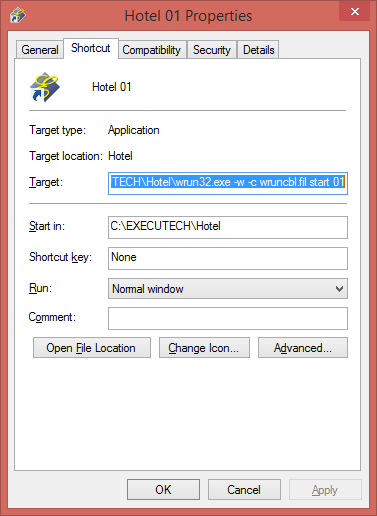 The Execu/Suite is best run using the ‘Environment’ tab of the user in ‘Active Directory Users and Computers’. Rather than placing the command line in ‘Target:’, you’ll place it in ‘Program file name’. If your server and Terminal Services server aren’t the same machine, be sure to use the UNC, just like in the first option. Otherwise, you should use the drive letter, just like in the example image. Using the UNC when the software is installed locally will cause severe performance issues. Failure to configure this setting can leave files locked that may prevent other users from running the software. They may experience errors caused by the locked files that can't be resolved until the disconnected sessions are ended. Make sure that the disconnected session settings are set in accordance to the needs of the property. You may want to be able to reconnect to a session after a few minutes if you experience frequent disconnects. You also want to make sure that a disconnected session doesn’t remain in that state indefinitely, causing the number of available users to be reduced by one even though the session isn’t in use. 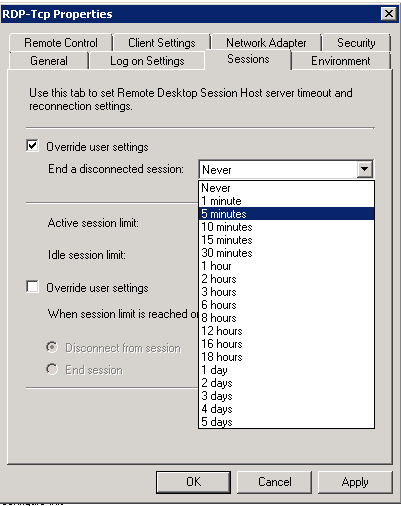 Setting an appropriate duration to ‘End a disconnected session’ can give the user time to reconnect if needed but allow the count of active users to be accurate if you’re unable to reconnect and close Execu/Suite, properly. We find that 5 minutes is a good setting. This can be set at the server level or user level, whichever your IT prefers. If you have a lot of terminals, it's important that the printers for each terminal are not published into the list of printers that all other terminals will see. This can create huge delays when the the software needs to display a printer dialog and can make printer selection confusing for the users. It's also important that printers that will be used in Point of Sale be static printers and not "session" or "redirected" printers.